Kyality: a blog about music, movies, tv, cars and design: Obauhaus. 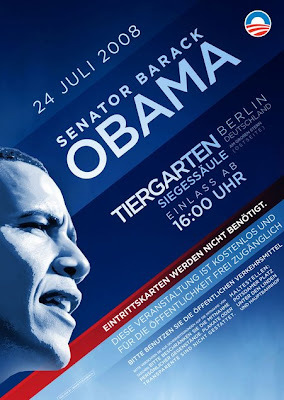 Check out this sa-weet poster for Barack Obama’s speech in Berlin yesterday. It’s a very Bauhaus-inspired design, which oddly enough lends itself well to whole patriotic/hope/change vibe he's got going on. It’s an awesome piece for sure. So here’s the question, is it bad to want to vote for a guy just cuz of good design? Seriously Though, Why So Serious? Bringing The Art To The Kart.